32GB Capacity, 2017 Model. SD Adapter included to allow you to use the card in a full-size SDHC/SDXC slot. Warranty and support, if applicable. M Model: SDSQUAR-032G-GN6MA. SKU: AD.tf-SD-Samsung[x50] Condition: New, Bulk, adapter only. SKU: AD.tf-SD-Samsung[x20] Condition: New, Bulk, adapter only. SKU: AD.tf-SD-Samsung[x100] Condition: New, Bulk, adapter only. 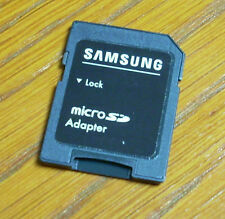 Samsung SD Adapter fits TF 1GB 2GB 4GB 8GB 16GB 32GB 64GB microSD microSDHC microSDxc Manufacturer: Samsung. SKU: AD.tf-SD-Samsung[x1] Condition: New, Bulk, adapter only. SKU: AD.tf-SD-Samsung[x10] Condition: New, Bulk, adapter only. Storage Capacity - 64 GB. OTG is short for On-The-Go. Card reader and HUB for Samsung Galaxy 10.1", 8.9", 7.7" and 7.0". One USB Port. ‣ Hard Drives. Reads & writes information from & to all cards. Compatible with all versions of SD/HC, MiroSD, CF, XD, MS/PRO & Duo cards. MAC 10.4.6 or greater. MICROSOFT XP and Window 7 & 8. MAC & PC System Compatibility. Extend the reach of your USB device! HAYATEC SMARTMEDIA MULTI MEMORY CARD READER KEY FEATURES: • 5 LED indicators show status of power-on and memory card slots while operating. • Directly transfer files between different memory cards simultaneously when connected to PC or Mac COMPATIBLE CARD TYPES: •Smart Media Memory Card (SM) MicroDrive Compact Flash: CF I, CF II, CF Ultra II • XD Picture Cards: M, XD, M • Secure Digital: SD, SDHC, miniSD (Requires SD Adapter),miniSDHC (Requires SD adapter), microSD/TransFlash (Requires SD adapter), micro SDHC (Requires SD adapter) • Multimedia Card: MMC I, MMC II, RS-MMC, HS-MMC • Memory Stick: Memory Stick, Memory Stick Pro, Memory Stick Duo, Memory Stick Pro Duo, Memory Stick MagicGate, Memory Stick MagicGate Pro, Memory Stick MagicGate Duo, Memory Stick MagicGate Pro Duo, Memory Stick. Great for android smartphone and tablet users. Super-fast transfer speed up to 80 MB/s. 57-in-1 Card Reader and Connecting USB Cable. (Micro SD/SDHC Card adapter not included). 3 Years Manufacturer Warranty. Compatible PC & MAC. Excellent Interface. Free Micro SD Card Reader. Release the space of your SD card and Backup your SD card. Card Adaptor. Compatibility (SD card, iPhone & iPad, Android Phone & Tablet with OTG). 1pcsMicro SD Card Reader. Copy the movie from SD card to your iPhone & iPad and watch and edit them easily. Available for: PC and OTG handy etc. Small, light and easy to carry. Anyway we will try our best to avoid this kind of thing. With SD / T-flashing slot. This OTG card reader supports phone or tablet with Micro USB port. Item Type: Micro USB TF Card Reader. For Other Micro USB Android Phones With OTG Function. This card reader can read Micro SD/TF card. 1 piece of 2 in USB OTG MicroSDXC Card Reader (MicroSD Card is not included). Support OTG function. Interface: Micro USB 5-Pin Male & USB 2.0 Male. USB Flash Drives. Plug and play, no need drive. Read / Write data from your smart phone to your micro SD /TF card. IPhone 5--iPhone 5c--iPhone 5s--iPhone SE-- iPhone 6--iPhone 6 Plus--iPhone 6s--iPhone 6s Plus--iPhone 7--iPhone 7 Plus Make sure your iphone 7 or iPhone 7 Plus has the latest system version . Free Micro SD Card Reader. USB 3.1 Type C USB-C to SD SDXC Card Reader Adapter For Macbook/Pro 2015-2017. 1 x USB 3.1 Type C USB-C to SD SDXC Card Reader Adapter. Notice: Card Reader Adapter ONLY, other accessories are Not Included. Genuine Pro Lexar USB 3.0 500MB/s Dual Slot SD and CompactFlash Card Reader. Interface Type: Universal Android USB interface. Product appearance: unique creative small portable. Support hot plug, plug and play. is required for every item bought from us. Not For Nexus 7 2013 edition! The standard USB 2.0 plug (type A) and micro USB plug (type B) combination, making the card reader compatible with all tablets and Android smartphones that support OTG function. For Samsung/Nokia/Ericsson/HTC etc(Including all cellphone&Tablet which with the Micro5pin or Micro11pin slot. 1 Mini 2 in 1 Micro USB 2.0 OTG Adapter Micro SD TF Card Reader For PC Samsung. Type: OTG reader. ). Genuine Sandisk Extreme PRO USB SD UHS-II USB-C USB 3.1 Card Reader. Genuine Lexar USB 3.0 XQD Memory Card Adapter Reader For above Lexar 1400X Card. 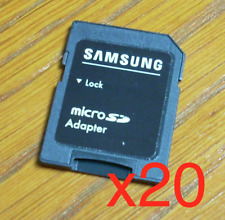 New SAMSUNG SD ADAPTER Only FOR MICROSD MICROSD CARD COMPUTER CAMERA SMARTPHONE. Condition is New. Shipped with USPS First Class Package. 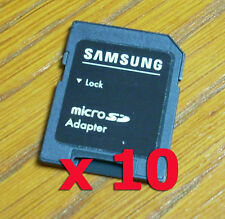 For Samsung/Nokia/Ericsson/HTC etc(Including all cellphone&Tablet which with the Micro5pin or Micro11pin slot. 6 Cavity Silicone Muffin CupCake Cookie Chocolate Mould Pan Baking Tray Mold. 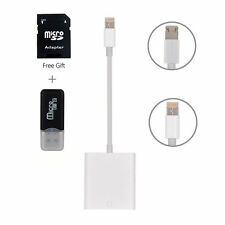 1 Mini 2 in 1 Micro USB 2.0 OTG Adapter Micro SD TF Card Reader For PC Samsung. ). Strong compatibility, support OTG type-c interface device. Interface type: OTG interface. Small size, no space, easy to carry. Size: 51.5 x 19 x 11 mm. We will be happy to resolve any issues you may have in a cordial and friendly manner. 1 piece of 2 in USB OTG MicroSDXC Card Reader (MicroSD Card is not included). Support OTG function. Interface: Micro USB 5-Pin Male & USB 2.0 Male. Plug and play, no need drive. Read / Write data from your smart phone to your micro SD /TF card. Strong compatibility, support OTG type-c interface device. Interface type: OTG interface. Small size, no space, easy to carry. Size: 51.5 x 19 x 11 mm. Due to the difference between different monitors, the pictures may not reflect the actual color of the item. Support SDXC,SDHC,SD,MMC,RS-MMC,Micro SDXC,Micro SD,Micro SDHC,UHS-C Cards. For Samsung galaxy S8 S8 . For Nokia N1 Tablet. For LG G5/G6. 1 x USB 3.1 Type C Card Reader in Black. For LG Nexus 5X. Type C USB 3.1 Connector with 2 slots- SD/MMC Micro SD/TF.